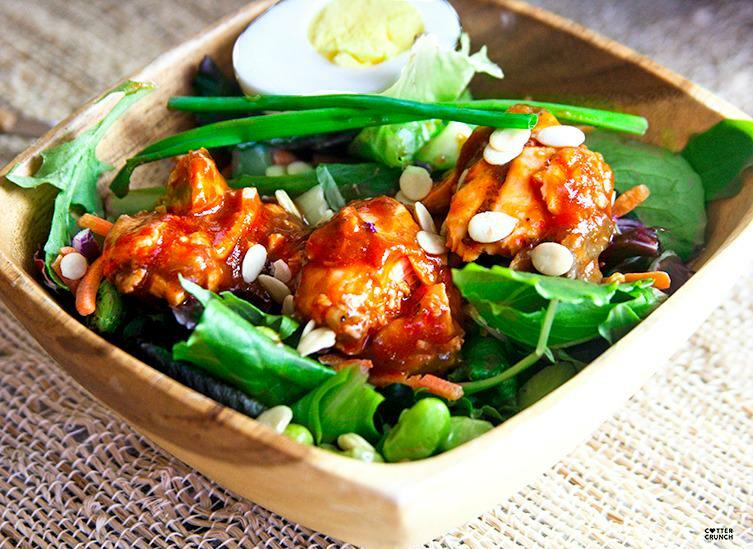 Tangy Asian BBQ Salmon Salad: A light gluten free dinner made with a sweet and spicy sauce and grilled salmon. Healthy and full of antioxidants, and it helps the body with Lycopene absorption! Goes great with edamame salad. Everyone has one in their family. You know, that person who doesn’t like this food or that food, but you on the hand love that food. Yep. That’s my husband. He usually likes ALL THE FOOD. He is not picky. But there are a few… asparagus, mushroom, and tomatoes. Which of course happen to be some of my favorite. Go figure! Those are some pretty important vegetables if you ask me. And right now, we need all the vegetables we can get. Hello allergies and low immune system. ACK! But I will let you in on a little secret. I might have tricked him into eating tomatoes and ABSORBING MORE LYCOPENE! What’s the big deal about lycopene and why all this talk about lycopene absorption? Lycopene is power antioxidant found in red colored foods, such as watermelon and tomatoes. You know I love me some watermelon and you know we love our antioxidants. Get to know more about lycopene here. But in order for us human folk to utilize lycopene, it needs some tender “FAT” loving care. In other words, it needs to be paired with a healthy unsaturated fat in order to be absorbed through the intestines. DING DING! We have lycopene absorption! We also have a way for my husband to eat tomatoes, use a fresh tomato paste and add in a little sweet and spicy seasoning. First, mix your spices and oil with the tomato paste. Then coat each salmon fillet with the sauce and add in a little more tamari or oil if needed. Save extra sauce if you have it. Let it marinade for about 10 minutes. Do not marinate much longer because fish flesh is more sensitive. Place on grill or in oven at 400F for about 10 minutes or 10 min per inch of thickness. Once cooked add any extra spices and sauce to the fish and place on bed of salad. we use sizzlefish salmon. You can also just use leftover grilled salmon or chicken and the toss the marinade with the meat/fish before serving. Sauce is great for leftovers too! Ahh yes, my sherpa wife skills at their finest. Don’t you think? Just kidding. Anyway, there’s a little food tip Friday for you. I know your brain cells might be checked out by the end of the week, so no hard feelings if you choose to ignore the nutrition nerd talk. Instead, just click to pin it the recipe and info for later. I save all my recipes on my COTTER CRUNCH GF Board. Follow Lindsay – Cotter Crunch’s board COTTERCRUNCH GF Recipes on Pinterest. Happy Foodie Friday! Or Food Tip Friday! Or Strange but Good Friday? Oh gosh, i’ll stop now. Do you have someone in your family who doesn’t like tomatoes? What’s your trick? I’ll coming over for dinner if you’ll make this. Deal? My son (and my dad) both don’t like tomatoes BUT they love ketchup and tomato sauce. I’m like, it’s the same thing (well, close, you know what I mean)! yum! I’ve never tried BBQ on salmon but I’m definitely going to! so many bright, gorgeous colors! looks delish! This is just the kind of meal I am craving! After too many long flights, lack of sleep etc., this is the kind of nourishment my body is craving and it has my fav flavour combos! I so understand that! but your trip looked amazing! P.S. I love that I always learn something about nutrition when I come here! I know that for a lot of people, the dislike of tomatoes is a texture thing, which is unfortunate. Cause I love me a tomato! Yum! And yes, my daughter is not a fan of tomatoes. Still haven’t developed a trick for that! 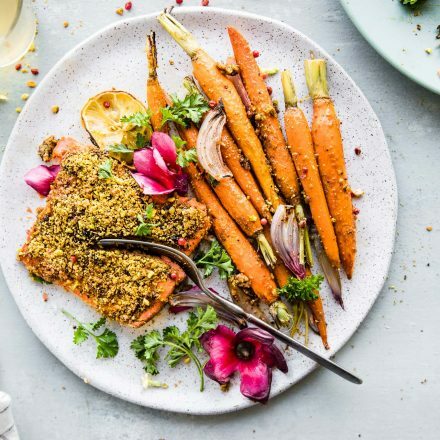 This looks sooo good, but do you think it could get my husband to eat salmon? Over here he is the picky one! Which is why it might just work better as a lunch for me 🙂 maybe worth a shot though! My kind of salad! Can’t wait to make it. This looks like exactly what I want to eat today! AH yea! 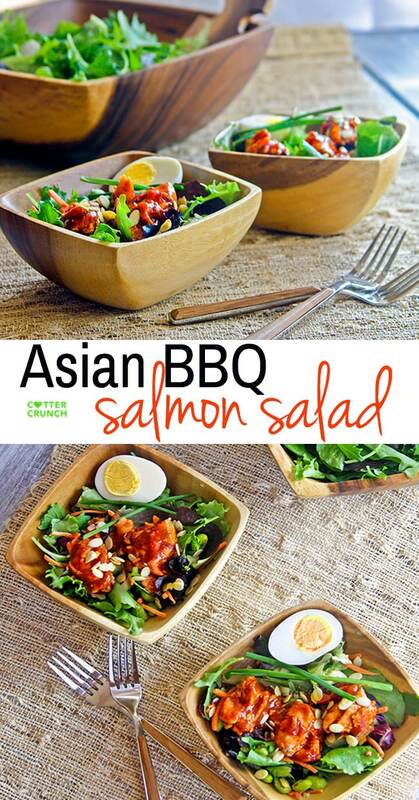 Asian bbq sauce and salmon….I want to eat that up! You know I love me some salmon, and bbq/asian flavors work great on their own with that fatty fish.. combined, surely a winner! Oooh I have some salmon in the freezer and was wanting to try something new with it! this would be perfect! My mum can’t eat tomatoes due to them being a FODMAP but she seems to do ok without them – until she has a salad and gets sad that she can’t have some sliced through it! Lindsay, your sherpa wife skills are impressive indeed! 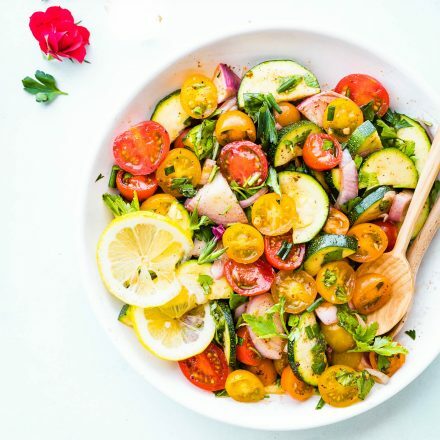 I am not a huge fan of tomatoes – but I will eat a ton if they are in a salad like this! YUM YUM! 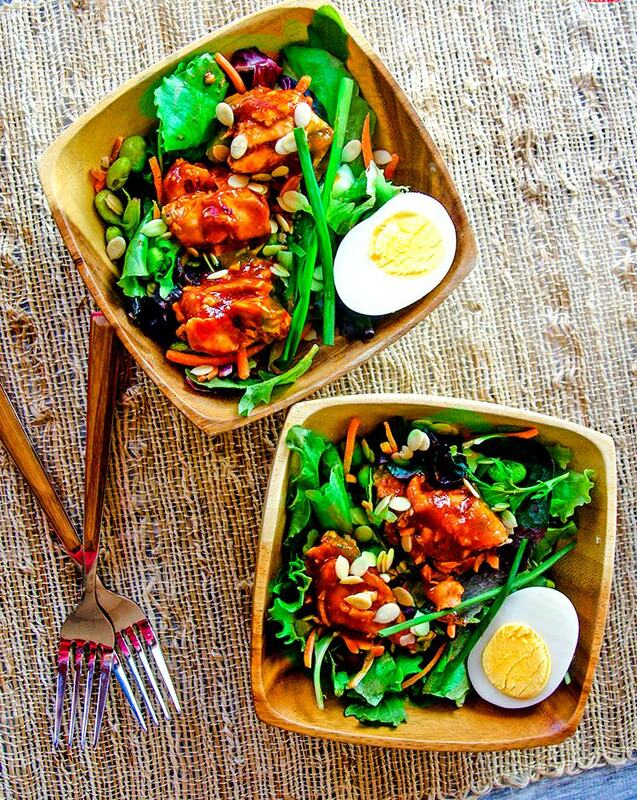 This looks good – now that the weather is getting warmer I’m all about salads!!! oh pizza! yes please. always! Yay for another way to use my Sizzlefish. I love making seafood salads. We have one at lunch almost daily! Looks delicious!! 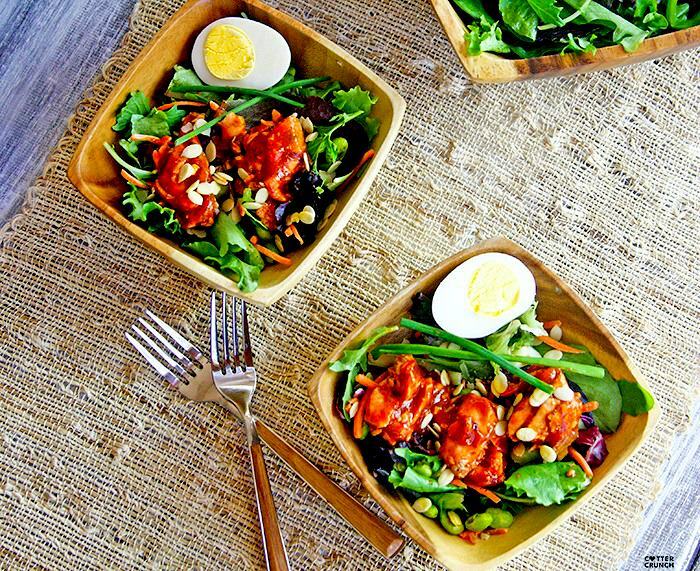 These days I am craving salads nonstop…pinned so I can try it later! 🙂 If you have a free moment, I would love it if you would stop by and share it with our #FoodieFriDIY party. 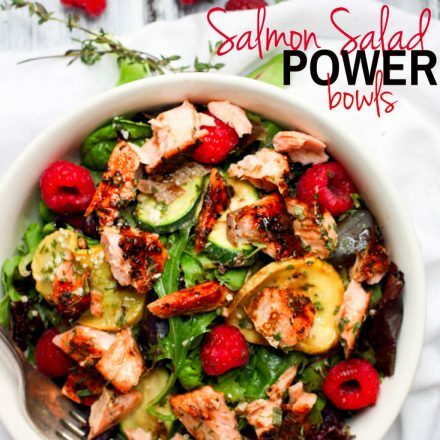 We have quite a few healthy foodies that link up…my favorite kind of recipes! Have a great weekend, Lindsay! YUM!! 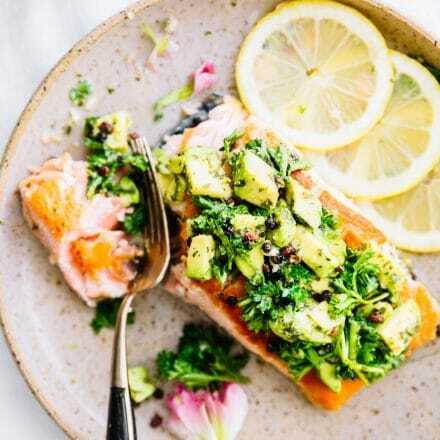 Too funny that I was out running around today and almost picked up fresh salmon, I didn’t because I am hosting a last minute baby shower and my fridge is packed, but was dreaming of bbq’ing it on the grill! Kicking myself for not picking it up but can’t wait to grab some next week!! Oooh, love me some salmon! Especially when mixed with greens. Yum! I knew you’d appreciate this fish! hehe. YUM! But not surprising coming from you! Thanks for being such an inspiration for our family! I do have family who doesn’t like tomatoes, yet they LOVE the chili that I made! It has a crushed tomato base, and they never even bring tomatoes to attention. Funny, huh? Happy Saturday, Linds!! YES! I read a study on that and ever since then, really made sure to embrace tomatoes (Well, more than I already did). You know my thoughts on this salmon! Just keep swimming… INTO MY MOUTH! I usually don’t say this. But Ommonomnomnom!!! Something about this shimmery, glossy, saucy salmon gets me. And how about–your whole family being picky? I’m the only one who loves everything…it’s kind of scary that I love everything, actually. 😉 And how informative is this, Lindsay!! I’m always on the lookout on how to maximize my nutrients and would have never thought of lycopene needing some fat luvin’. I think now is the perfect chance to finish that watermelon in the fridge, hehe. OMG amazing!! 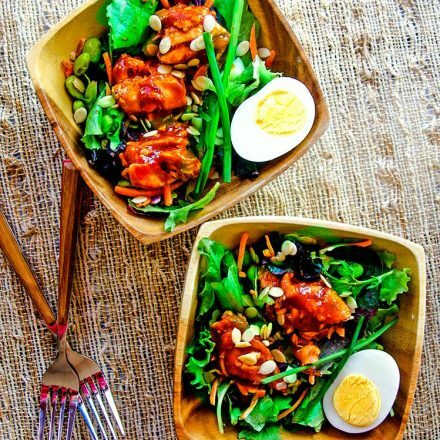 I just can’t get over this yummy recipe!